The Altra Kids Bookcase makes a great addition to any kids' bedroom, from tot to teen. Featuring a simple white finish and a graceful, curved silhouette, this versatile bookcase looks great in any style décor. Four spacious shelves provide room for all their favorite books, as well as toys, movies, music, photos of friends and other personal items. At the base of the bookcase, a semi-enclosed compartment provides a convenient spot to place all the stuff that usually clutters the floor, such as sports equipment, game pieces, balls and other oddly shaped items. The Altra Kids' Bookcase works well in both boys' and girls' rooms and offers an attractive storage solution that will help ensure their space stays neat and tidy. Your little one is sure to love it - and so will Mom and Dad! 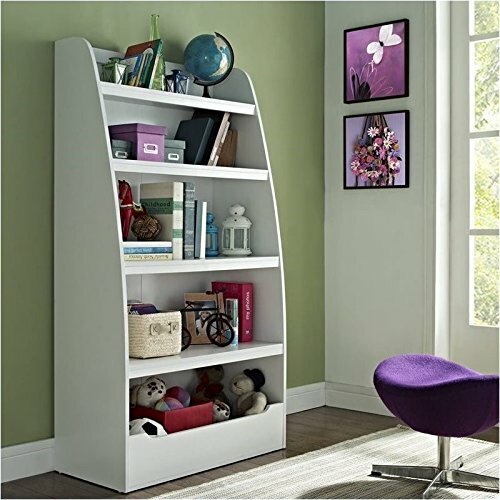 Features: Open shelves hold toys, books, and personal items Assembly Required White Finish Specifications: Overall Product Dimensions: 60" H x 31.57" W x 15.51" D Product Weight: 67.1 lbs.